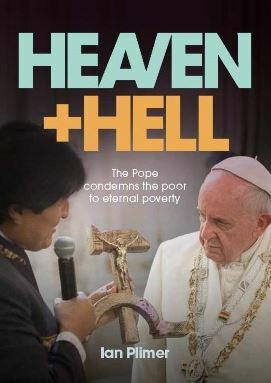 Launched this month, a new book by Ian Plimer, Heaven and Hell, is a frontal attack on the absurd, science-free claims peddled by, of all people, Pope Francis in his recent encyclical, Laudate ‘Si. Throughout the book the author lists many of the infamously false predictions and bogus items of “evidence” from clomate scientists and the media. This litany provokes incredulity and quiet rage as the reader is confronted time and again by the gullibility of journalists, whose professional responsibility it is to be better informed. That the global warming scam and scandal has flourished for as long as it has testifies to the scientific illiteracy and political leanings endemic in modern newsrooms. Interestingly, The Age, in its summer break, is letting through some interesting think pieces. The latest, by British columnist with London’s The Daily Telegraph, Allister Heath, calls out the Pope, whose hostility to capitalism he feels is tragically misplaced. He has repeatedly savaged free markets and aligned himself with the views of Thomas Piketty, the far-left intellectual who obsesses about inequality and advocates crippling taxes on income and wealth. Apparently, the Pope believes that the absolute autonomy of markets is a new form of tyranny. It was a strangely inaccurate vignette of the modern economic system, which is characterised by not-so-free markets that are routinely bailed out, subsidised, taxed, capped, fettered, regulated and distorted by activist governments and their monetary and fiscal policies. North Korea is a genuine tyranny; free trade and genuine free markets are anything but. “evil” for the likes of Sir Richard Branson to have been allowed to keep the money he earned by providing the public with goods and services, and that we need immediate equalisation through punitive taxes. Such an extreme approach would have catastrophic consequences, annihilate incentives to work, save and invest, and halt the progress of human civilisation. Heath points out facts that many seem to ignore; that human prosperity has increased astronomically worldwide and absolute poverty has been halved in a few decades. It reminds me of Matt Ridley’s The Rational Optimist, which outlines just how extraordinary has been human progress in wealth creation, for everyone, everywhere. But unthinkingly to fight capitalism – the greatest alleviator of poverty and liberator of people ever discovered – makes no sense. The sooner the world’s great religions learn to love the wealth-creating properties of the market economy, the sooner they will be able to harness them to make the world a better place.